Introduction: The shipment of loaded small arms ammunition and the transportation of ammunition in checked airline luggage is regulated by the federal government and sometimes by state governments. In addition it is regulated by the companies that ship the ammunition and by the commercial airlines that transport the baggage. All of these rules are subject to change, and do change regularly. Always call and check on the current rules before shipping ammunition or carrying ammunition in your checked baggage. THE FOLLOWING INFORMATION IS PROVIDED AS GENERAL GUIDANCE ONLY, AND IS NOT NECESSARILY ACCURATE OR DEFINITIVE. IT IS ONLY THE AUTHOR’S BEST UNDERSTANDING OF THE RULES AND REGULATIONS AT THE TIME OF PREPARATION IN EARLY 2008. Transporting ammunition in your checked baggage on a commercial airline flight. The first rule is that LOADED AMMUNITION MAY NEVER BE SHIPPED THROUGH THE US MAIL. The United States Postal Service will not allow shipment of loaded ammunition. Inert ammunition and components may be sent through the mail, but should be clearly marked as inert on a small note included inside the package to prevent a misunderstanding. The transportation of small arms ammunition is regulated by the Federal government in 49CFR173.63 (link to document at Note 1 below). This regulation also defines packaging requirements. 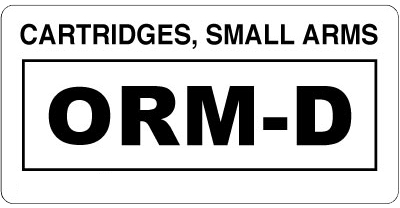 To determine the specific hazardous material code for ammunition (UN code) other than that which 49CFR173.63 authorized to be shipped as ORM-D, contact the Department of Transportation Hazardous Materials Hotline (800) 467-4922. Again, this information is the author’s best understanding from reading 27CFR178 and may not be accurate. If you have any questions you should contact the ATF at (202) 927-7772. Importation of small ammunition into the United States is regulated by the ATF under 27CFR178.115 and 120. Authorization for importation is obtained through an approved importation permit (Form 6 Part I ATF F 5330.3A or From 6 NIA/ATF F 5330.3D http://www.atf.treas.gov/forms/5000.htm#firearms). For information on import permits contact the ATF at (202) 927-8320. A Form 6 can be used to import small arms ammunition up to .50 caliber. Non-US citizens (Non-Immigrant Aliens [NIA] in ATF language) may import ammunition for display at shows. The application for the Form 6 NIA must be accompanied by a copy of either a valid hunting license or an invitation to attend a show or conference issued by an ATF approved organization. The annual IAA sponsored St Louis International Cartridge Show is ATF approved. If a NIA wishes to buy ammunition in the US it is advisable to have a hunting license. A Form 6 does not authorize the purchase of ammunition. There is no limit on the quantity of ammunition on an individual Form 6, but the ATF may question the application if the quantity is excessive. Quantities of 1000 to 2000 should generally be acceptable for an individual. Once issued, a Form 6 is valid for one year. The column marked "US MIL" is for the Munitions Import List category for the ammunition that is III. Below is an example of how the ammunition should be listed. Generally the list is on a separate attached sheet, and the basic form only contains a summary line for the total quantity. Note that 7.62x25mm ammunition (and 7.63mm Mauser ammunition) of Russian manufacturer cannot be imported because of a special restriction established in 1997 and recently the restriction has been extended to most 7.62x25mm ammunition made in Eastern Europe. The ATF has established a database to track arms and ammunition importation and the list attached to a Form 6 must be entered in this database which is time consuming. The ATF is also screening the list in much more detail (like the 7.62x25mm restriction above) and it is more likely that the permit will be returned for revision if it is not complete and meets all Federal requirements. YOU SHOULD ALLOW A MINIMUM OF 4 MONTHS AND IDEALLY 6 MONTHS FOR FORM 6 APPROVAL. Apparently, UPS does not accept international shipments of ammunition. FedEx will accept international shipments, but the shipper must complete the shipper declaration in compliance with International Air Transport Association (IATA) regulations. The person at the other end will have to contact a shipper who is IATA certified to handle the shipment. Small arms ammunition is regulated by 49CFR173.56 (which can be found through http://hazmat.dot.gov) and is hazmat classification code 1.4S (UN Code 0014). 49 CFR 173.63. Most airlines allow ammunition to be shipped with checked baggage, but my experience is that the requirements vary significantly between airlines. IN ALL CASES YOU SHOULD CHECK WITH THE AIRLINES BEFORE ATTEMPTING TO CHECK BAGGAGE CONTAINING AMMUNITION. Generally there is no detail information on shipping ammunition on the airline web sites. You should call the toll free number for the airline and talk to customer service. Generally, in the US, the requirements for the airlines which permit ammunition in checked baggage are as follows, but these may vary considerably for specific airlines. Requirements in other countries may vary but these seem to satisfy the requirements in Europe. A maximum of 11 pounds (5 kg) of ammunition may be carried in a passenger’s checked bags (Note this is an international requirement). LOOSE AMMUNITION IS NOT ALLOWED. Ammunition wrapped in paper and packed in a metal can is not allowed, even if it is an ammo can (not a small amount). Plastic ammo boxes for 20-50 rounds seem very acceptable to TSA if the smaller cartridges are wrapped in paper to keep them from rattling around in spaces intended for larger cartridges. Remember “securely” is used repeatedly by TSA so it is wise to use tape or rubber bands to make sure the ammo boxes stay closed, even if they snap. The bag must be locked but hard-side bags are not required for ammunition. The bags must be checked at the check-in counter, and may not be checked at curbside. You have to declare the ammunition to the ticket agent, and they (or TSA) will usually want to inspect it to ensure proper packing. You must declare your ammunition to the airline. Failure to do so violates U.S. Federal Law. Violators may be subject to a maximum penalty of 5 years' imprisonment and a $250,000 fine (49 U.S.C. 5124). Loaded ammunition may never be carried in hand-carried baggage. The Transportation Security Administration (TSA) website (http://www.tsa.gov/travelers/airtravel/assistant/editorial_1666.shtm) provides data on packing ammo and http://www.tsa.gov/travelers/airtravel/prohibited/permitted-prohibited-items.shtm indicates that ammunition may be transported in checked baggage and offers the following advise. Ammunition - Check with your airline or travel agent to see if ammunition is permitted in checked baggage on the airline you are flying. If ammunition is permitted, it must be declared to the airline at check-in. Small arms ammunitions for personal use must be securely packed in fiber, wood or metal boxes or other packaging specifically designed to carry small amounts of ammunition. Ask about limitations or fees, if any, that apply. When transporting ammunition from overseas, you must have documents authorizing possession of ammunition at point of departure as well as a Form 6 Part II authorizing importation into the United States. The requirements vary by country, but most countries in Europe will issue a permit to authorize ammunition to be transported through their country. Check with the appropriate embassies early in your travel planning for the specific rules and the appropriate forms. In many cases the form is filled out before hand and presented when you cross into a country, so no pre-approval is required. In other cases the permit must be approved before arrival or departure. When carrying ammunition in your baggage either in the US or on international flights, you can expect to have your baggage inspected, particularly by the TSA baggage checker in the bomb screening unit. In all cases, you must have an approved Form 6 Part I/ATF F 5330.3A or From 6 NIA/ATF F 5330.3D to enter the United States with ammunition. For the forms and instructions see: http://www.atf.treas.gov/forms/5000.htm#firearms. The bottom line is to make sure you understand the current regulations for what you plan to do!!! Regulations by the governments, shippers and airlines change periodically. It is best to check. Again, this article is only intended as an overview and represents the author’s best understanding of the rules as they existed when this material was written, but could contain errors or omissions. It also may well be out of date. DO NOT RELY ON THIS ARTICLE AS YOUR AUTHORITY TO SHIP, IMPORT OR TRANSPORT SMALL ARMS AMMUNITION.